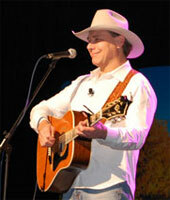 Chanteur Country US né Michael James Peterson, le 7 Août 1959 à Tuckson (Arizona). Though Michael Peterson is an Arizona boy who got into the music business through a college football teammate, he wound up with one of the most popular country hits of 1997. Born in Tucson, Peterson grew up in Washington state, listening to his grandmother's wide-ranging music collection, overloaded with classic American songwriters, including Cole Porter and Harold Arlen, as well as obvious choices like Roger Miller and Willie Nelson. After earning a football scholarship to Pacific Lutheran University (and winning a national championship), he hooked up with former teammate Brad Westering, who was working as a producer for Deniece Williams and others. Peterson wrote several songs for potential use by Westering, and began traveling occasionally to Nashville. Michael Peterson began working professionally as a songwriter in late 1995, after making connections with writers like DeWayne Blackwell, Josh Leo, and Robert Ellis Orrall. 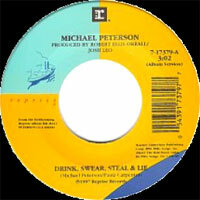 Encouraged by Leo and Ellis Orrall to try his hand at recording as well, Peterson made a demo and soon found a contract with Warner Bros. His self-titled debut album appeared in mid-1997, heralded by the rough-and-rowdy hit single "Drink, Swear, Steal & Lie," plus a duo with Travis Tritt. Peterson's sophomore effort, Being Human, appeared in 1999. 03/1999 SP REPRISE 7-16995 (US) . 07/2002 CD MONUMENT NSK 16696 (US) .